Currently, I am on a major turmeric kick…well, along with my brunch kick. I think a lot of the world is on a turmeric kick. It seems to be a very trendy ingredient right now. And with good reason. Turmeric is incredibly healthy for us. As for my brunch kick, well, I’ve just really been into healthy winter breakfast and brunch recipes lately. Say hello to these banana pancakes and these colorful antioxidant packed smoothies! I’ve got to say, just looking at those smoothies makes me smile, they’re so full of color and brightness. Winter blues be gone! Or well, that’s if you have the winter blues. I am still very much enjoying the snow, and even the shorter days. There’s something so cozy about the winter months. 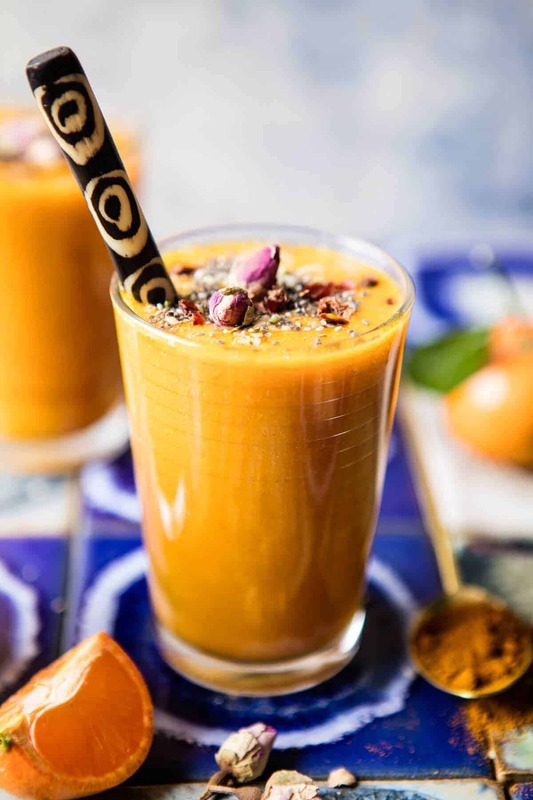 But staying on topic here, this orange turmeric smoothie…we’re now more than halfway through Healthy January and I’m still loving each and every recipe I have posted. This drink is no exception. It’s sweet, loaded with citrus, and packed full of so many good things that will keep you energized and full right through until lunch time. Yes, please! I am really excited to announce my partnership with Florida’s Natural. 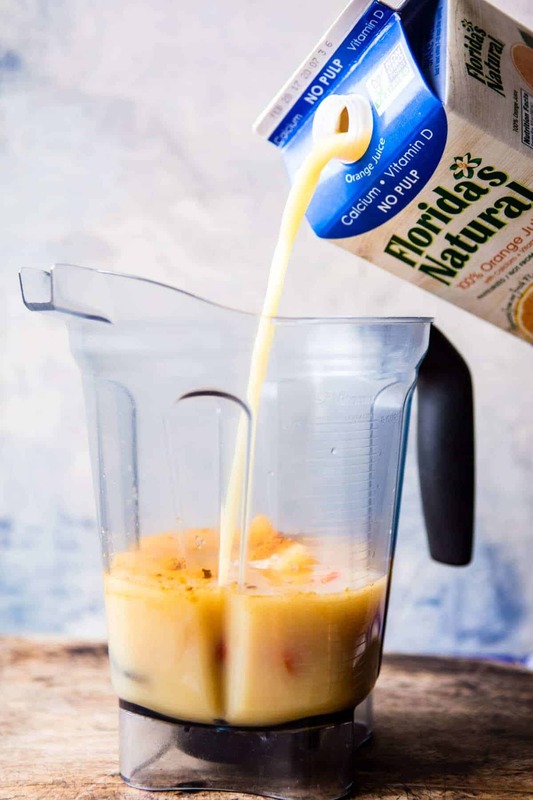 It has always been my go-to orange juice because it’s made from one simple ingredient…FLORIDA ORANGES. No water, sugar or preservatives are added. <–amazing, right?! To me, this is the best news ever. Orange juice should be just that, orange juice, and nothing else. 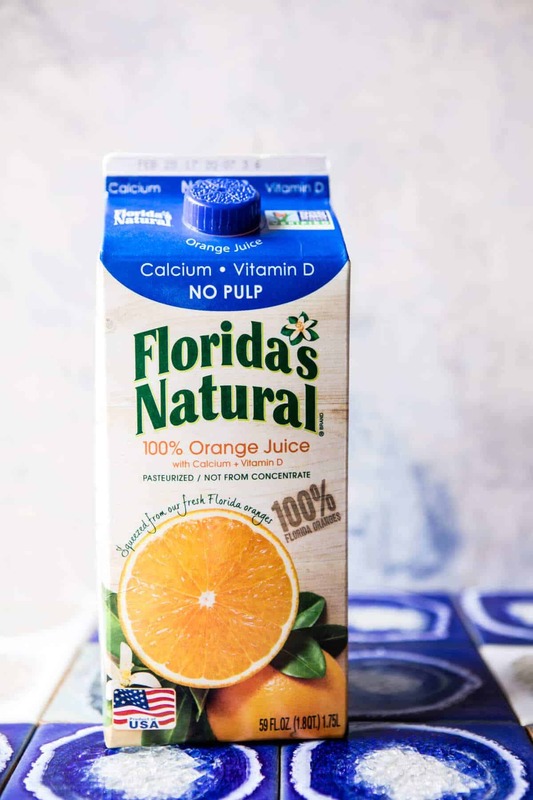 I am all about eating foods in their simplest form, especially when it comes to fruit, and that’s what you get with not-from-concentrate Florida’s Natural® Brand Orange Juice. So you can see why I am excited to be partnering with them! …their orange juice comes from pure Florida oranges. There are no artificial flavors or ingredients. All of their products are made entirely in Florida, using the citrus that their growers produce. Love this! …they don’t mess with their growers’ oranges . 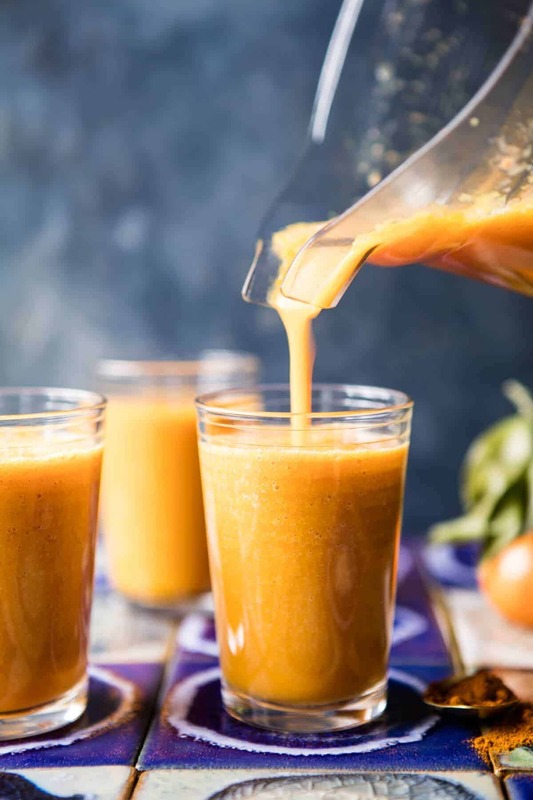 To make the juice, they simply squeeze the oranges, flash-pasteurize it, and pour it into cartons that ensure a straight-from-the-grove taste. COOL! 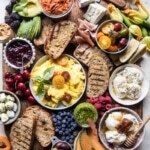 Plus, my partnership with Florida’s Natural means that I’m now a member of the Florida’s Natural Brunch Club, which brings together bloggers of all different backgrounds to share our love of all things breakfast and brunch. I’ll be bringing you guys some of my favorite brunch recipes over the next few months. 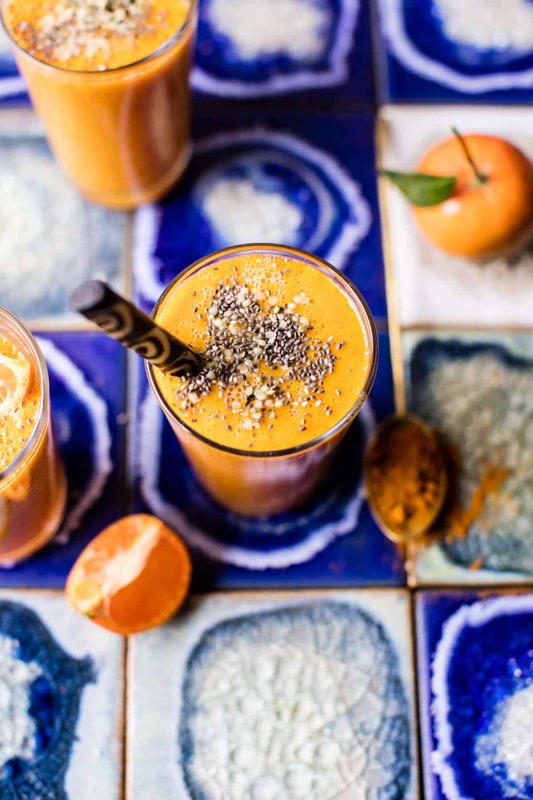 Which brings me back to this superfood-packed smoothie. All month long I have been upping my weekend brunch game. Meaning, my Saturday and Sunday mornings have been spent making pancakes, waffles, french toast, eggs, bacon, pretty much every yummy brunch item out there. I realized recently, that while my meals were all pretty solid, I needed a good citrus-based smoothie to serve alongside my overeasy eggs, toast and fresh fruit. 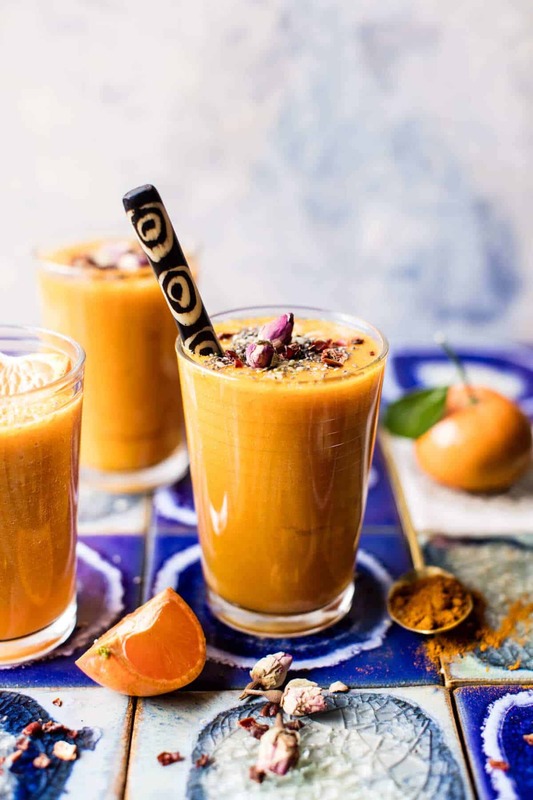 Since my pantry is stocked with orange juice and turmeric, I knew I wanted those two ingredients included in my smoothie. From there, I just kind of threw some of my favorite things into a blender and hoped for the best. The recipe needed a few tweaks, but the smoothie you see today is my favorite. Again, the color has me hooked, but the sweet, warm and cozy flavors are what I really love most about this recipe. Basically all my favorite things. 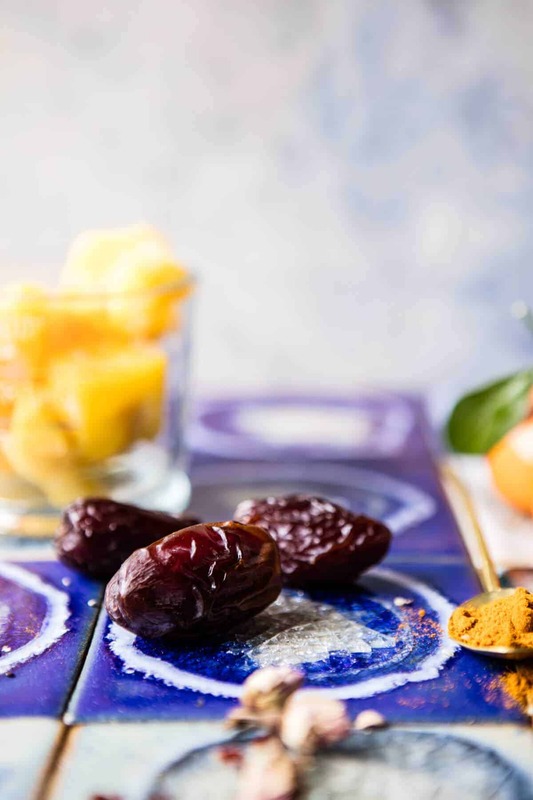 The dates add sweetness, while the mango pairs well with the turmeric, which we all know is a nutrition powerhouse. Turmeric is a major cancer fighter, along with loads of other benefits. Studies have shown curcumin, one of turmeric’s healing compounds, to be a better anti-inflammatory choice than aspirin or ibuprofen. Curcumin also dramatically increases the antioxidant capacity of the body, AND…it can be used as an anti-depressant. If you are new to maca powder, it is a superfood full of protein, fibers, vitamins + minerals. It helps to balance hormones, increase fertility, balance mood swings and increase energy. See? Powerhouse ingredient. I order mine on Amazon, but it can also be purchased at Whole Foods or other health food stores. If you don’t feel like buying it (I get it, it’s yet another ingredient), it’s totally optional, so feel free to leave it out. 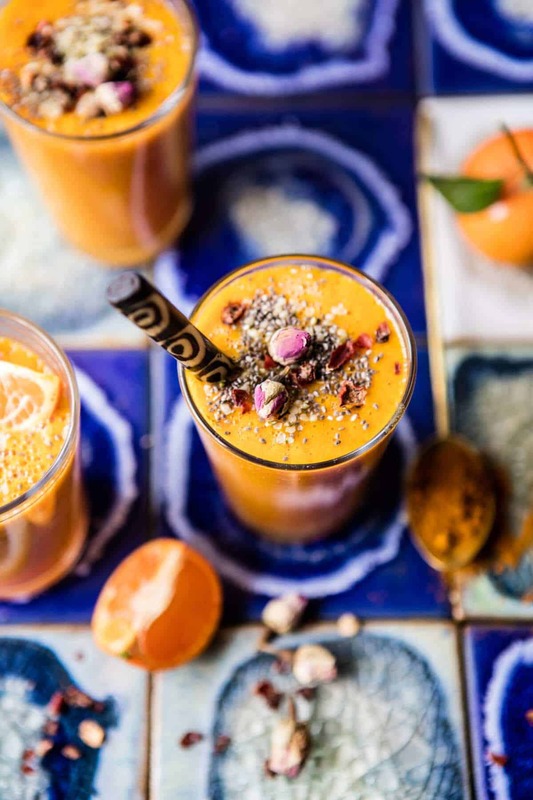 This smoothie is great for on-the-go snacking, a quick breakfast before work or school, or the perfect beverage to serve at your next brunch! I have major plans to make it this weekend for a little breakfast in bed action. Already way too excited about it!! Who’s with me?! 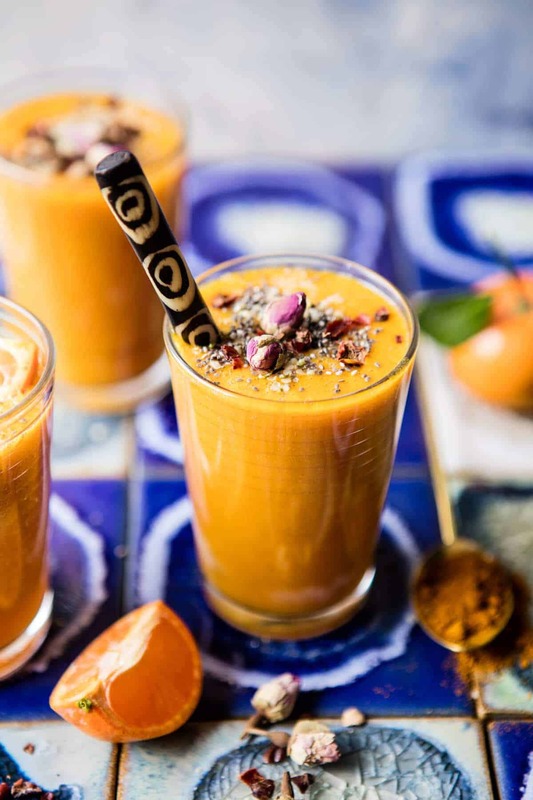 In a high power blender, combine the orange juice, coconut water, dates, carrot, mango, vanilla, turmeric, maca power, and a pinch of salt. Add a large handful of ice and blend until completely smooth and creamy, about 3-5 minutes. Divide between 2 glasses and top as desired. Enjoy! Congrats on the collaboration! I’m definitely on a turmeric kick too – I made a lentil, chickpea and turmeric soup for dinner yesterday! 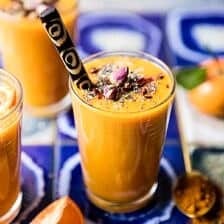 I love feeling extra healthy because of all the health benefits connected to turmeric. Oh, and I totally agree with you: orange juice should be just that! Ooo that sounds so good!! I am glad you’re liking this, Vivian! Thanks! Thank you; in so into turmeric and edible flowers ! Have a pleasant day ! Haha I am so happy you love these, Annie! Thank you! Oooh I love this. I agree, turmeric is definitely on the up as a go to hit for flavour! It does wonders for your metabolism too. I’ll have to give this juice a try! I hope you love it, Bronnie!! Thank you! We’ve been adding fresh turmeric root to our tea but haven’t tried using the ground one. Must do so. Thanks for the inspiration! Ooo sounds like it would be great in tea! Thanks Julia! Yes, it so is! Thank you Laura! Their orange juice is ahhhh-mazing and I love that you used dates in this!! I couldn’t resist using them! Thanks Jennifer! Love this! I keep a package of dates in the fridge to sweeten all my smoothies! Love the combo going on here Tieghan! Such A great idea, thanks Kathy! Such a perfect way to start the day, love this! So happy you think so, thanks as always Matt! Their OJ is a staple in our house. After spending a week away with only from concentrate grossness at breakfast, I was happy to come home to it! 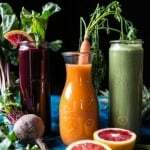 Loving the look and ingredients of this smoothie. I’m so into the turmeric thing right now too! Loving this smoothie Tieghan! Nothing beats fresh OJ in the morning, and with all the added health benefits of turmeric this one’s a winner for sure! Yes, totally in love with using turmeric, thanks Mary Anne! Love some of the lighter colors you’ve been using to shoot lately. SO GORGEOUS! I love this so much!!! GORGEOUS and delicious! So happy you like it Alice, thank you! just tried and loved it,thanks for sharing the recipe. So happy you like it thanks! 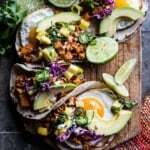 just tried this recipe and loved it thanks for sharing it. I first bought turmeric powder last year for my dog because he was having digestive issues. Added 1/8 tsp to 1 cup rice and he started improving immediately. Now I try to serve him that once in a while. I’ve never used it for myself although I know it has so many benefits. 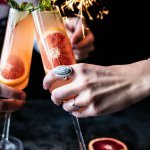 This drink looks so happy and delicious I definitely have to try it :). Yes! Turmeric has so many benefits! I hope you love this drink, Sandy! Thank you!